The pace of modern life often leaves people leaving exhausted and feeling unable to keep up. In order to stay on the track and maintain the energy needed to go through the day, most people turn to quick fixes to boost their energy, like sugar. But, does sugar really help boost your energy? There’s no denying that sugar can give you an energy boost, but the problem is, it won’t be effective as you may think it is. If you’re looking for a quicker route to staying alerted and improve your energy level, sugar isn’t going to help you. According to a study published by Human Psychopharmacology: Clinical and Experimental, sugary drinks and sweets will actually worsen your energy levels, and make you feel more lethargic and heavy-eyed than you already were. Consuming sugar will have a short-term effect on your energy level. It will give you a short burst of energy and make you feel perkier, but, the effects of the “sugar high” will quickly wear off, leaving you in a worse state than you were in to begin with. After the effects of glucose in your body wear off, you’ll feel weary and less focused, which will leave you turning to another sugar fix to feel that high again, and that’s when the cycle begins. Not only that consuming sugar isn’t good for your overall health, it can have a devastating effect on your level of energy. Once you start using sugar as a way to feel more energetic, you’ll always need to have more sugar to maintain the level of alertness and energy you want. This way, you create a perpetual cycle of using quick-fixes to maintain your energy, which is bound to have a negative impact on your health, all without actually addressing the problem and finding a real solution. After the initial burst of energy, you’ll experience a so-called crash or state of lethargy and sleepiness. This leads to consuming more and more sugar until you won’t be able to feel energetic unless on a “sugar high”. Not only that sugar has a detrimental effect on your overall health, it’s also highly addictive and it can wreak havoc on your energy level. Instead of boosting your energy and making you feel more spirited, it will leave you feeling lifeless and fatigued. 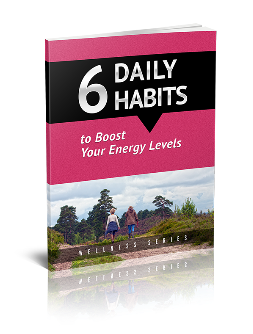 You can improve your energy levels without having to use shortcuts that are bad for your health. If your body craves sugar when you’re not feeling energized, the biggest part of that urge is of psychological nature. By resorting to quick fixes to boost your energy, you’ve trained your brain to connect sugar to feeling energized, which leaves you jonesing for sweets whenever you feel tired. The first thing you’ll need to do in order to break the habit of using sugar as a quick energy fix is to become conscious of this ineffective and unhealthy pattern. Just by being aware of the harm sugar does to your energy level and overall health, you’re already halfway there. To ensure you’ll be breaking this negative cycle of using sugar as a quick-fix for good, introduce wholesome high-energy foods and healthy habits. When you’re feeling tired, instead of reaching for the energy bar or a sugary snack, go for a walk or do a light cardio workout. Being physically active will increase your blood flow and oxygen levels, as well as stimulate neurotransmitters in your brain, which will make you feel more energized in an instant. If you’re looking for a healthy food alternative to sugar that packs an energy punch, ditch the low-fat regime. Foods with high levels of healthy fats and proteins are not only good for your health, they will keep you energized too. Grass-fed beef, avocado, olive oil, cheese and yoghurt- these are all high-energy foods that are actually good for you. In case you’re looking or an energy-boosting snack, seeds, nuts and antioxidant- rich foods like blueberries are great at keeping you alert and animated. With your new, healthier regime, energy slumps will become a distant memory. The key for feeling energetic and enthusiastic is weeding out the unhealthy habits such as quick sugar fixes and forming new ones that benefit you both immediately and in the long run.